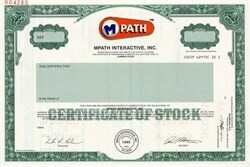 Beautifully engraved RARE specimen certificate from MPath Interactive, Inc. printed in 1999. This historic document was printed by the American Banknote Company and has an ornate border around it with a vignette of an the company name and logo. This item has the printed signatures of the Company’s President, and Treasurer. Not only will people go to the Internet for information, they will also go to it to meet and interact with other people. Mplayer, scheduled to debut 1996, will bring the excitement of real-time multi-player gaming to the Internet's World Wide Web for the first time. It will feature popular PC-based games from well-known game publishers. Mplayer's features will include voice-capable games and chat rooms where players can converse as they play the games, watch games in progress and choose teams or opponents. In February 1997, they began to offer internet play for free for their major commercial games such as Quake, as well as card and board games such as Scrabble and Spades. In this, they were one of the first major commercial communities on the internet to offer such a service. They continued to add many new games to their offering. The slogan that was used from its founding was "Wanna Play?" By the end of 1998, the company had a staff of 111 employees, and about 80 by late 2000. 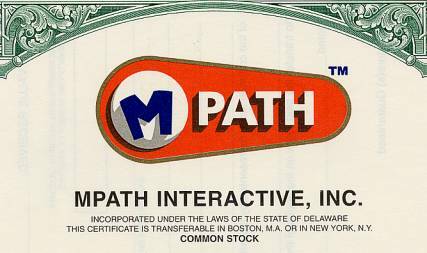 The company was listed on NASDAQ beginning April 29, 1999 as MPTH, which changed to HEAR by late September of the same year. History from Wikipedia and OldCompany.com (old stock certificate research service.